Fall 2014 second and third series. 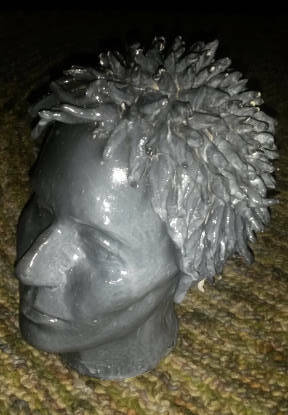 This piece is a press molded head meant to contain all the sundry bits and pieces in my head. 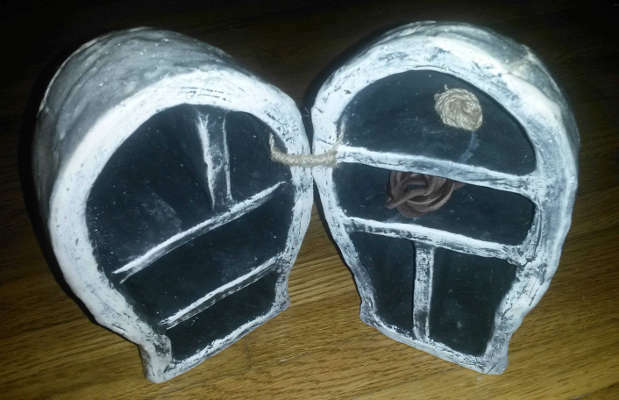 There are a couple of things, like I might have built the hinge differently and I might have made ears, but on the whole this piece is exactly what I was after. These press molded pieces were a huge change for me, and I learned a lot about what I do and don’t like about how I work. The second piece from this series, I made a self-portrait with features how I imagine myself. The interesting thing about this is that by the end of making the features from my imagination, I found I missed my own features very badly. This in and of itself was worth every bit of this series. The third series from this semester is about celebrations. I started with the day I received my first radio, on my ninth birthday. That is one of the biggest events in my whole life, and from there I traced a brief series of songs and the events over the last 27 years that are tied to those songs, or vice versa. 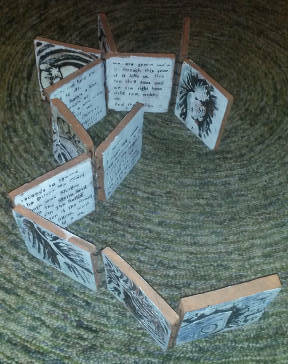 The tiles are bound together with leather strips in an accordion style book, with narrative on one side and images on the other, with a couple of sidebars. This piece is one of my favorites in a long time. Working with a longer format story was incredibly difficult, and there are plenty of new things to try in future projects, relative to telling more narrative with images, using text as enhancement, and finding the best word and images to tell the crux of the stories. This is super exciting! As I have been working through the narrative pieces I have been pursuing the past two semesters, two things have become very apparent to me: 1) I am unexpectedly a huge fan of the dichotomies between beauty/ugliness, love/hate, dependence/independence, dominance/submission, agency/forgiveness, and all of the grey and overlapped areas these things inhabit, and 2) I need to let go of my inner resistance to non-literal figurative sculpture. These two realizations become particularly clear in relation to Kathy Ruttenberg’s work. 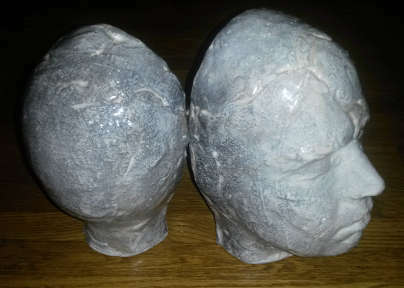 Her play with/manipulation of “normal” relationships in the sculptures embody a lot of what I love about those grey areas. Who is the care-giver? Who is the dominant force here? What transpired to create this havoc? Is there beauty under the chaos? How can something that could be so sublime become so unsettling? I am still digging through Kathy’s portfolio, and hope to find further explanation as I go. Addendum: Actually, I hope I never find any answers, and can just keep thinking about this. 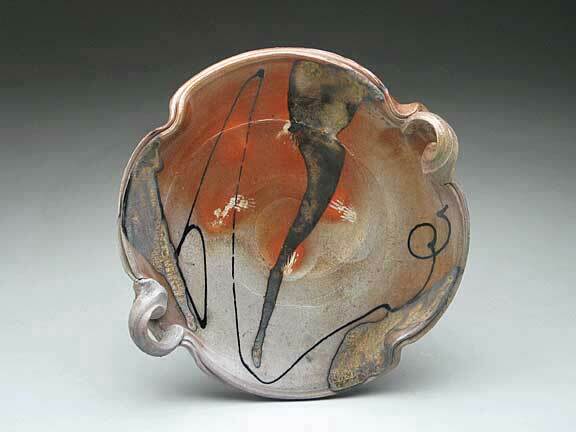 Having been thinking about Celebrations for class work, I have been fascinated by Josh DeWeese’s pottery surfaces. 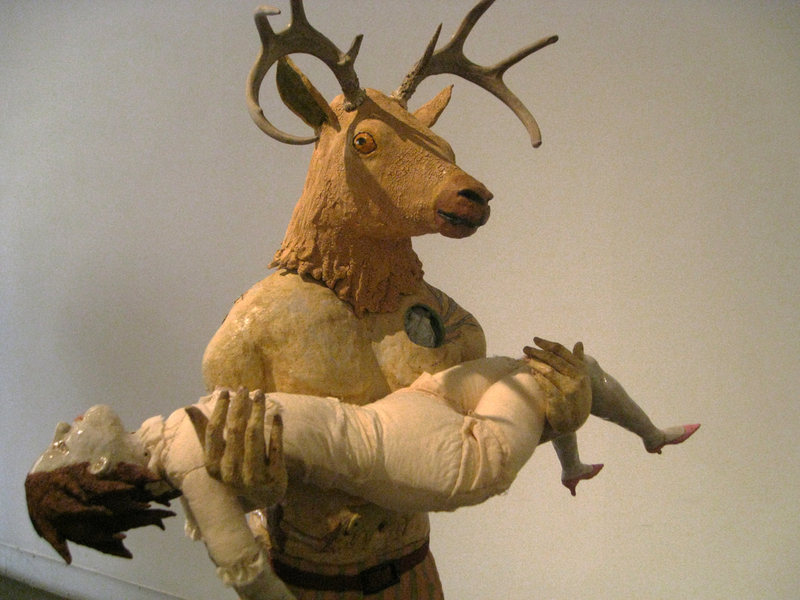 In the article, Josh DeWeese, A Review, by Craig Adcock, Josh speaks frequently about his drawings and glazes, layered upon one another, building interest and a story to pique curiosity within the viewer. This aspect of his work is one that I have always been drawn to. 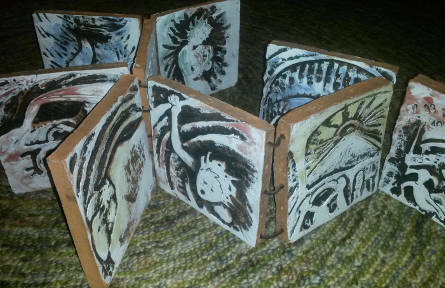 Using the kiln (woodfiring) to add to his glazing and drawing to create something wholly its own- relinquishing control of the results- seems to me to be the best kind of celebration. While Josh’s forms are somewhat simple, they echo the fluid lines and dancing colors from his drawings and the kiln firing process, making a complete embodiment of the vibrancy that he pursues in his work. For the fourth installment of my Ceramics Art and Perception reading, I found myself particularly drawn to Quietly Continuing- The Teapots of Tineke van Gils, by Anthony E Stellaccio. These teapots are made of porcelain from Dehua, China, and the main characteristics of this clay is that it has an extremely short working time. It is so un-plastic, that any wet working must happen quickly and precisely, and then be done. This is a striking disparity against what van Gils work ends up looking like. The teapots in the article are beautifully fluid, luxurious, and pristine. This, accompanied by the author’s description of van Gils as a joyful thrower, is a wonderful result. In thinking about this relative to our themes this semester: origins and identity, this is such a lovely combination- taking something fundamentally (originally) unworkable, and giving it a fluid and beautiful life (identity). 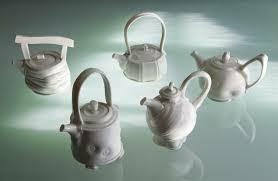 Not only could that be a metaphor for life, but these teapots are just plain gorgeous as well. Teapots are one thing I have thoroughly enjoyed making, but have never found a voice in, and these are very inspiring in that regard. Looking at the photos in the article, the swooping handles, spry spouts, and precisely altered bodies all combine to show van Gils joy in throwing, and belie the difficulty of the clay. I could look at these all day and see some new detail to find joy in every time.